We all want that flawless no filter needed pictures to post on our social medias. Not only do we need to take care of our skin to keep it looking healthy and glowing but having the right makeup also helps. 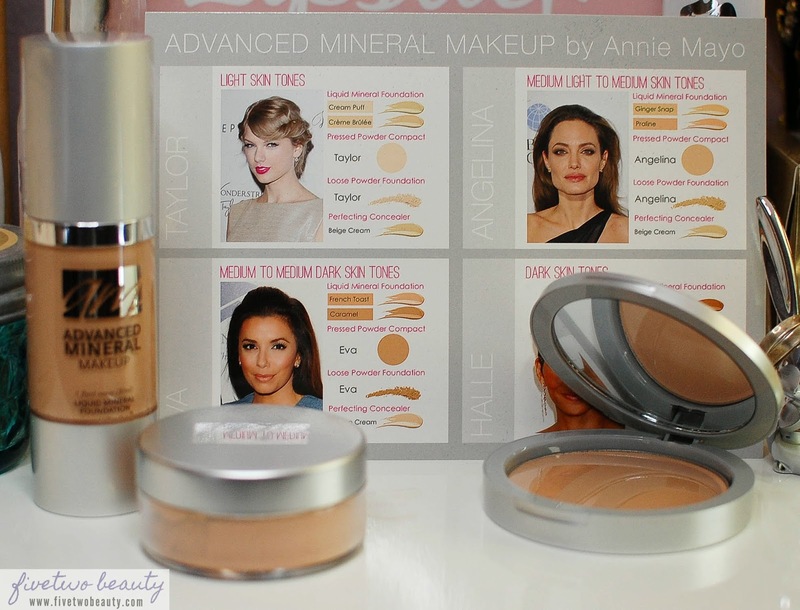 Advanced Mineral Makeup is one of the those makeup products you need to try and I'll tell you why just keep reading! During New York Fashion Week, I got my makeup done with Advanced Mineral Makeup products and noticed my pictures from that day made my face looked really great! Smooth and flawless like I am seriously, no joke about to post these pictures without any filters! Founder/CEO Annie Mayo is also a TV and Film Makeup Artist. She has been in the beauty and cosmetics industry since the late 70's and was also a former salon owner and aesthetician. The past three years have been devoted to testing, refining and marketing Advanced Mineral Makeup which is a line of all natural, paraben- and preservative-free mineral makeup and cosmetics. The three products that I will be reviewing came from their Shade Finder card which makes it really easy to pick which products suits your skin tone! Since I have been hibernating and all covered up the past Winter months, my skin is lighter than usual so I went with products for Medium Skin Tone. Pressed Powder Compact in Eva: foundation, powder, concealer and SPF all in one. Very water resistant and 100% VEGAN. It has a semi-matte finish and light diffusing properties to make skin appear flawless and youthful. I used the Advanced Mineral Makeup -Liquid Mineral Foundation in French Toast over different face primers I have and this wears better without any. It has a light coverage that can be built up to medium coverage after 2-3 pumps. Wearing this alone, I noticed it clings to my dry spots and fine wrinkles. I like to apply this with my fingers since with a brush it leaves streaks and doesn't really buff well. The Advanced Mineral Makeup Loose Powder Foundation in Eva wears beautifully alone and has a medium coverage. This shade is too dark on me right now but this will be great to wear alone in the Summer once I get a little tan for everyday wear. It's best used when buffed with a foundation brush. I use Real Techniques Buffing Brush. The Advanced Mineral Makeup Pressed Powder Compact in Eva I love to use as a setting powder for the Liquid Mineral Foundation. Wearing this alone does not give enough coverage to even out my skin tone. It does make the skin look flawless when applied over the liquid mineral foundation. I also like using this as a touch-up powder with a big fluffy powder brush when my T-zone gets oily mid-day. 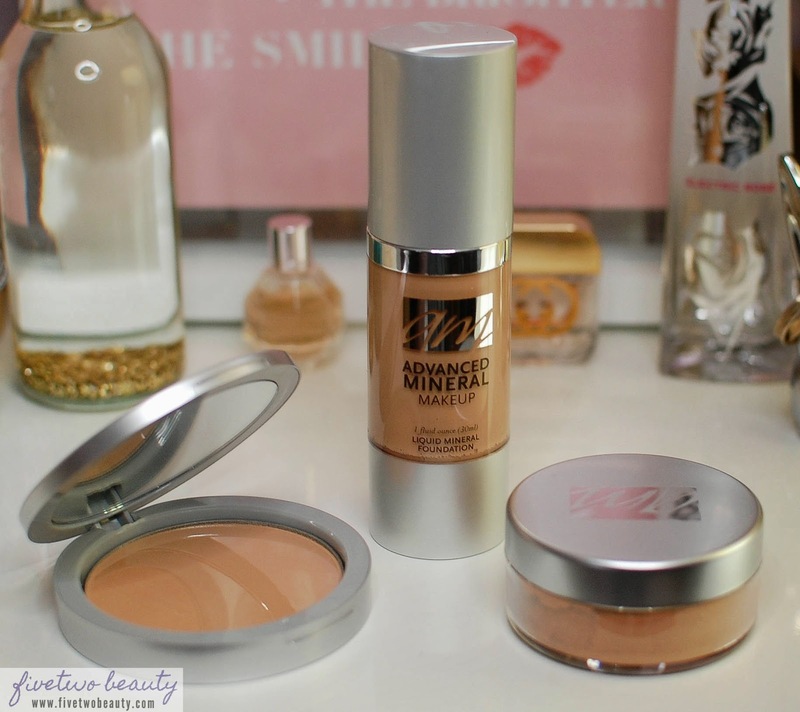 Overall, I have noticed using all three products together gives the most flawless looking skin. It does not feel heavy at all on the skin. I have been using all three as my everyday foundation makeup. Without any finishing spray, I do notice less coverage around my acne scars and nose at the end of the day. I do still use my favorite go-to concealer (CoverFX Cream Concealer) over any redness and acne scars to even out my skin tone. Just like with any other mineral powder foundation I have used, this clings on to my dry patches (like around my nose and drying blemish) so to not make it anymore worse I moisturize my face really well to prep my skin. As my skin's natural oils comes through, the dry patches aren't as obvious and as bad. The pictures you see below were taken with an iPhone 5s camera 8mp camera lens, not the front-facing camera. I also took selfies from different lighting the one on the left with my Simple Human Sensor Mirror and the picture on the right is natural afternoon sunlight facing a window. It minimized the appearance of pores but not fine wrinkles. Selfies looks great that I surely don't need a filter or do I need to adjust the exposure or light with my pictures! 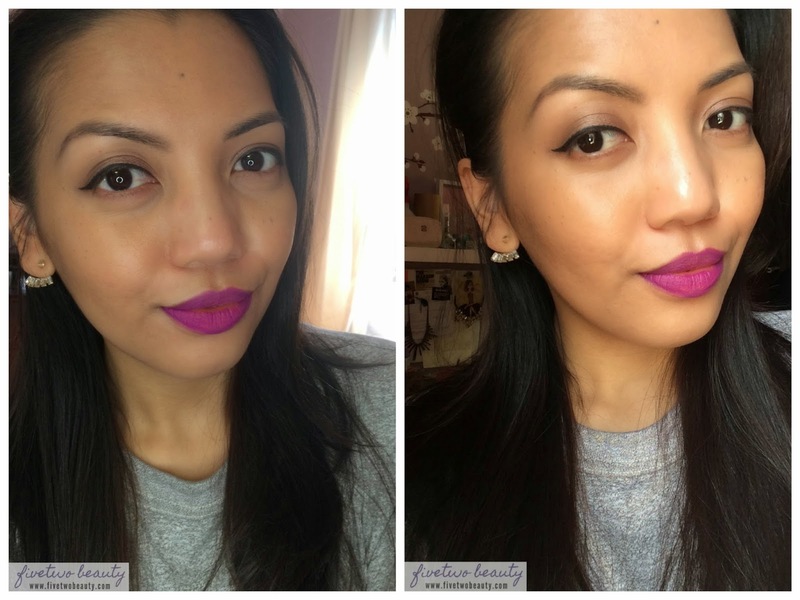 *Products were sent for a review but all opinions stated on this blog is 100% mine. Go to the Disclosure Policy tab for full blog disclosure information. The Makeup Show's 10th Year !! !